We nearly felt all four seasons during October, including a warm start, a mid-month tropical storm, the eventual arrival of fall, and the first frost in some areas, which left growers finishing their harvests. The second tropical system passing through North Carolina in as many months delivered another round of dousing rainfall, this time in the western half of the state. The rain from Michael as well as from a low pressure system associated with the remnants of Pacific Hurricane Willa on October 26 contributed to the preliminary statewide average precipitation of 5.40 inches, which ranks as our 15th-wettest October since 1895. Michael made landfall as a Category-4 hurricane along Florida's Gulf coast on October 10, and when it reached North Carolina, it was still at tropical storm strength. Along with rainfall totals of more than 4 inches, Michael brought strong winds that downed trees and power lines across the western Piedmont. 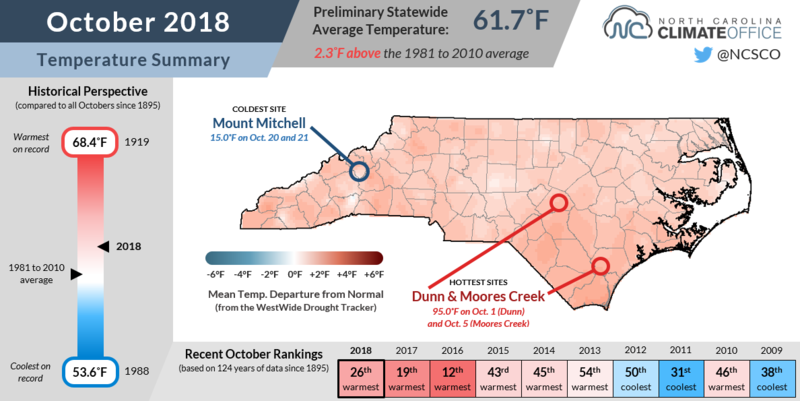 With a monthly total of 8.67 inches of precipitation, Statesville recorded its 5th-wettest October in the past 108 years, while Boone's 11.07 inches of rain was its 3rd-wettest October in the past 39 years. Rainfall from Michael in southern Macon and Jackson counties helped remove a small patch of Abnormally Dry conditions that popped up after several dry weeks in late September. North Carolina is now completely clear of any drought or dryness -- just as you'd expect after two tropical storms wrung themselves out over our state. 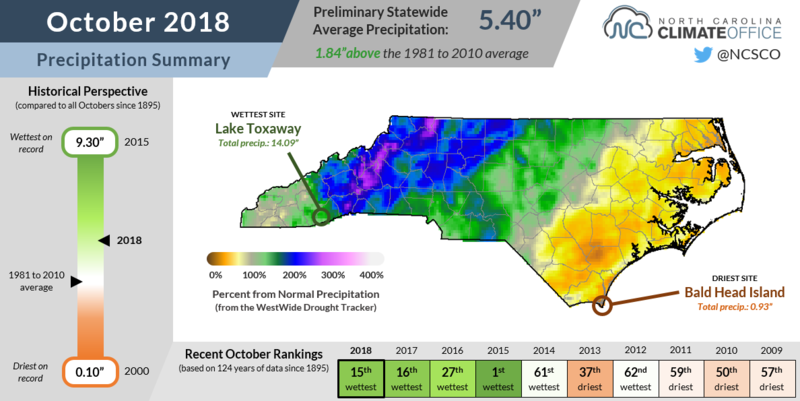 Fortunately for coastal areas that received heavy rainfall from Florence, Michael did not bring as much precipitation, and October was a drier-than-normal month overall across the Coastal Plain. After recording more than 24 inches of rain in September, Wilmington received just 2.50 inches in October. That drier weather aided the ongoing recovery efforts after Florence, which the Office of State Budget and Management has estimated caused $17 billion in damage in North Carolina -- more than the damages from Floyd and Matthew combined. Go figure that it took a tropical storm to finally break our stubborn streak of summer-like weather. 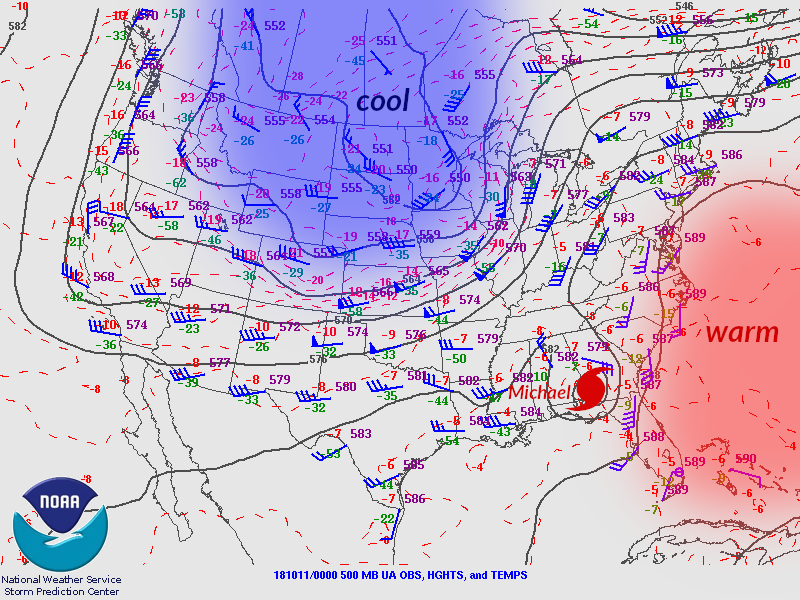 After record warmth in the first ten days of the month, the persistent upper-level ridge over the eastern US finally pushed offshore as Michael moved through. In the wake of the storm, we felt our first true taste of fall with high temperatures only in the 50s and 60s on several days. However, that early-month heat meant we still ended up with a warmer-than-normal month overall, as our preliminary statewide average temperature of 61.7°F ranked as our 26th-warmest October on record out of the past 124 years. The warmth was most evident in our nighttime lows, which ranked among the top ten warmest on record across the state. As in September, a number of cloudy, humid nights kept temperatures from dropping too much. The western part of the state did see at least one chilly morning on October 22 when temperatures fell into the mid-30s -- cold enough to bring the first frost of the season in those areas. 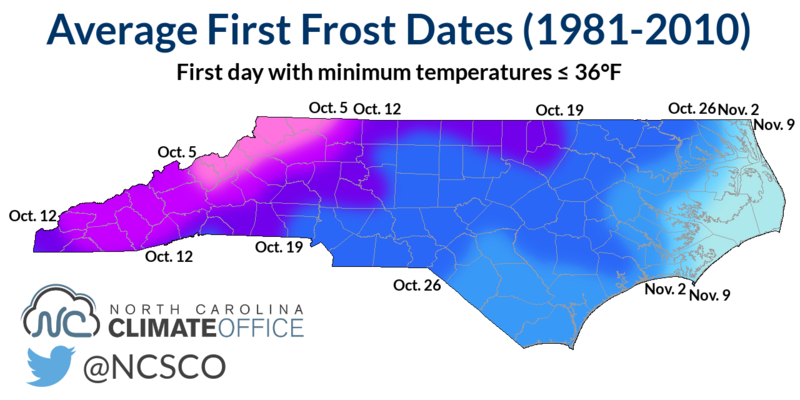 That frost event was roughly right on schedule as far as our normal timing goes, but most of eastern North Carolina is still waiting on the first fall frost. Likewise, only a few locations in the Mountains and Foothills recorded temperatures at or below freezing last month. While the first such occurrence normally occurs in late October or early November, current forecasts suggest more warm weather is likely through at least the middle of the month, so we may be waiting a while for that first freeze. 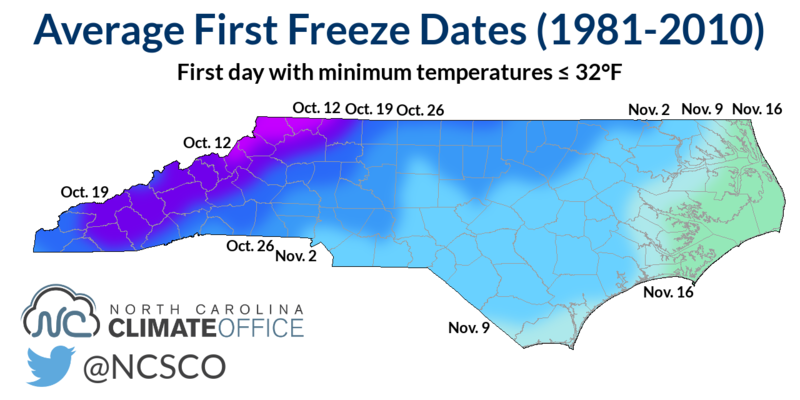 For reference, last year's first widespread freeze event occurred on November 11. Although most of the state avoided drought this summer thanks to regular precipitation, the heavy rains and high winds from Florence and Michael took a toll on crops across the state. USDA Crop Progress Reports from the past month help tell the story of what proved to be a challenging growing season in many areas. 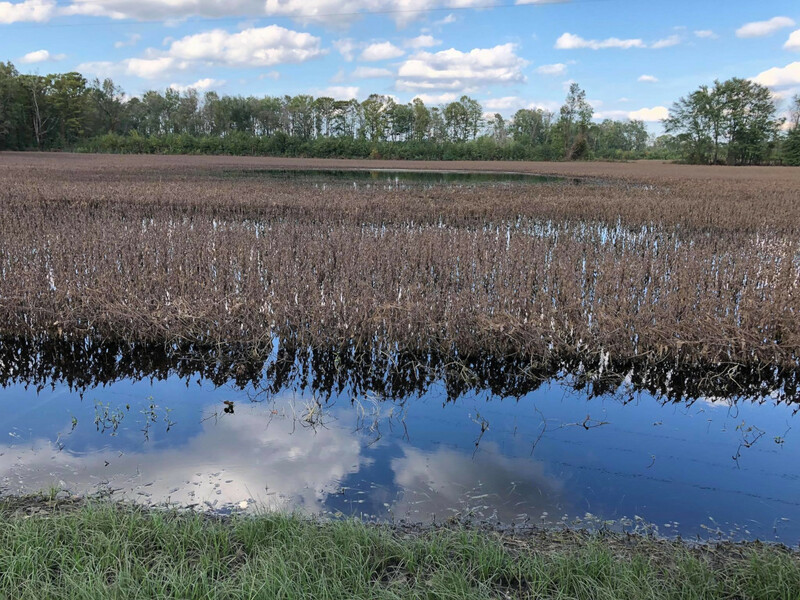 Flooding in soybean fields in Jones County two weeks after Hurricane Florence hit. Hurricane Florence ripped this area apart. Crop damage ranges from light to severe. Blueberry fields were completely under water. Corn was about 85% harvested prior to the storm and growers are trying to salvage the remaining acres. Soybean harvest started. Some yields are OK, some are a disaster. Quality is marginal. Cotton and soybean harvest continues with yields below earlier expectations. Dry weather in August appears to have had a significant impact on some maturity groups. Cotton is variable with most damage following recent storms. Small grain planting has begun but planting intentions are somewhat down. With Hurricane Michael dropping approximately 10-11 inches of rain here [it] caused a lot of washed out roads and power outages. Several tobacco farmers that had tobacco curing in the barns lost these. Several people across the county are still without electrical power. This second hurricane for the season pretty much devastated the remaining tobacco crop that needed to be harvested and soybeans and corn that needed to be harvested. Rain has delayed the cutting of silage and hay. Producers are rushing to try to finish silage harvest before Hurricane Michael comes ashore. Temperatures are warm for this time of year. Temperatures cooled considerably later in the week with most areas of the county receiving the first frost as lows dipped into the lower 30's. There were some reports of snow flurries in the higher elevations as well. Most crop harvesting has been completed, except for corn for grain. As the growing season wraps up statewide, farmers in the eastern part of the state will continue to harvest cotton, peanuts, and soybeans, along with planting winter wheat and grasses. Those growers will be hoping for a better winter than their hard-luck, hurricane-hit summer and fall.